We’d love your help. Let us know what’s wrong with this preview of Equus by Rhonda Parrish. There’s always something magical about horses, isn’t there? Whether winged or at home in the water, mechanical or mythological, the equines that gallop through these pages span the fantasy spectrum. In one story a woman knits her way up to the stars and in another Loki's descendant grapples with bizarre transformations while fighting for their life. A woman races on a uniq There’s always something magical about horses, isn’t there? Whether winged or at home in the water, mechanical or mythological, the equines that gallop through these pages span the fantasy spectrum. In one story a woman knits her way up to the stars and in another Loki's descendant grapples with bizarre transformations while fighting for their life. A woman races on a unique horse to save herself from servitude, while a man rides a chariot through the stars to reclaim his self-worth. From steampunk-inspired stories and tales that brush up against horror to straight-up fantasy, one theme connects them all: freedom. To ask other readers questions about Equus, please sign up. Ahoy there me mateys! I received this fantasy short stories eARC from NetGalley in exchange for an honest review. So here be me honest musings . . . This was a short story collection that I requested because it was about me first love of ponies before the sea stole me heart. And it had a story by Jane Yolen. I was super busy and needed something that I could easily pick up and put down at whim. So I figured that this would float me boat. Unfortunately, I spent a lot of time wanting to put this do Ahoy there me mateys! I received this fantasy short stories eARC from NetGalley in exchange for an honest review. So here be me honest musings . . . The first story of this collection was certainly interesting. I loved the main character, Annie. She was quirky, funny, and not at all what I expected. It involves knitting. I loved her banter and her husband’s responses. I thought this was a great first story if very unusual. Can’t explain more than that. This was overall by far me favorite story of the batch. It was about a young girl named Bea who races limerunners (“native Floridian cousin to the Scottish kelpie” source) at the local racetrack after dark. These horses have to be kept near water. They also have to be kept with care because they are carnivorous, nasty, and kill. Bea’s mother makes a bet with her daughter’s future as a consequence. The outcome of the night’s race has never been more important. The ending was perfect. I would love to read future tales of Eel and Bea. This is a story concerning half-breeds of Gods. Odin especially. I didn’t like this story at all. The story was confusing and the main character, Verity, made some really bizarre and crazy choices. I did like her transformations but it wasn’t enough to make me care about the characters or the world. Also the story seemed like a chapter picked out of a larger narrative. This was actually was even more confusing then the previous story as crazy as that seemed to me when reading. This story takes place in London in 1900 five days after the alien invasion. The aliens are these weird tripods. There is a Moreauvian named Fletcher with special powers. I didn’t understand where these people came from. I didn’t understand what happened at the end and what was learned. I did like the main character, Emma and her horse, Beezus. But mostly I was just confused. Again it seemed like it was a chapter pulled out of a larger work and it was poorer for it. This was an amazing concept, characters, world, and plot at first. This deals with war bands that fight with unicorns in a medieval like setting. I adored Galyne and her unicorn Nova. This was exactly fitting me mood and I was reading with pure delight. Then came the plot twist and it soured. It involves a trigger for many people and I was so sad that the author chose to take it there. I thought good points were made in the circumstances that were presented and I even thought the author handled the conclusions well. However, I would have preferred a very different direction. In fact I would love this story to be expanded so I can get more of Galyne and the world. Mixed feelings on this one but disappointment lingers. This story felt like a western wrapped up with ghosts and magic horses. I loved the world and the main characters of the Rider and her horse, Peregrine. This was an engaging story but overall seemed like we are missing too much backstory. The story did have a clear beginning and ending but overall there were just too many unanswered questions. Highly engaging though. This was the reason I picked up this book and then I read it and was sad. It’s a very short poem and not really a story at all. I didn’t hate the poem. I just wanted something along the lines of “a plague of unicorns” which I reviewed here. So I loved one, partially liked three, hated two, and thought one was a tease. Ultimately many of the stories felt incomplete and unsatisfactorily. I am glad I read it for the parts I liked but when I began reading the next story, I realized I didn’t want to spend more time reading it. I am not sure I will ever finish it. For me it was a mixed bag but perhaps ye will like it more. All I know is that I am glad I picked it up because of the joy that was reading about Eel and Bea. Thank you World Weaver Press! The Captain leslie hamod wrote: "I'm sorry you are disappointed.😣"
It happens. Not all books can be for every person. Thanks for caring! Arrr! Received this book in a give-away and am happy I did. Not my usual genre, but there's always the love of horses - even fantastical ones. Excellent writing in these unusual and riveting stories. I may have to venture out more! Wow, that a fantastic anthology. Not a bad story in the bunch. The settings and horse mythologies are incredibly diverse, too, ranging from unique takes on the results of Loki's, ahem, shapeshifting habits to a fae creature in Newfoundland to several fresh secondary worlds. If you love fantasy stories and horses, do yourself a favor and get this. Equus is a delightful collection of stories which, as you might expect from the title, all feature horses in one form or another. There's an eclectic mix, including Sleipnir and unicorns, and most of the tales are fantasy or magical realism. As always with an anthology, some stories appealed to me more than others. There was only one at which I took umbrage, and that was because it set up a major plot idea but then suddenly ended, as if, perhaps, it was an intro to a novel. To me, anthology stor Equus is a delightful collection of stories which, as you might expect from the title, all feature horses in one form or another. There's an eclectic mix, including Sleipnir and unicorns, and most of the tales are fantasy or magical realism. As always with an anthology, some stories appealed to me more than others. There was only one at which I took umbrage, and that was because it set up a major plot idea but then suddenly ended, as if, perhaps, it was an intro to a novel. To me, anthology stories should be complete in and of themselves; I don't want to have to go out and buy another work to see how the tale will end. But that's a minor complaint as the rest of the stories were all most enjoyable. If you love horses and fantasy, this is definitely a collection for you. This was a wonderfully eclectic anthology, with practically any stripe of fantasy a grown-up weird horse girl could want on offer between the covers. I was partial to the kelpie variants, with Diana Hurlburt's sweat-soaked Florida twist on the legendary beasts ("Eel and Bloom") being a standout and Stephanie Cain's "To Ride a Steel Horse" being a wonderful surprise. It was a pleasure to find that the stories ran the gamut of genres and tones, though--the copy isn't kidding when it says the uniti This was a wonderfully eclectic anthology, with practically any stripe of fantasy a grown-up weird horse girl could want on offer between the covers. I was partial to the kelpie variants, with Diana Hurlburt's sweat-soaked Florida twist on the legendary beasts ("Eel and Bloom") being a standout and Stephanie Cain's "To Ride a Steel Horse" being a wonderful surprise. It was a pleasure to find that the stories ran the gamut of genres and tones, though--the copy isn't kidding when it says the uniting factor is horses and the freedom they represent. Equus has its share of horror, magical realism, high fantasy, and borderline science fiction, with no two tales having quite the same flavor; if one isn't quite your cup of tea, the next is right there for you to try. Angela Rega's unexpectedly wrenching "The Horse Witch" rubs shoulders with Cat McDonald's bitter tribute to female anger in "The Last Ride of Hettie Richter," and Susan MacGregor's elegant trifle "Ladies Day" stands next to M.L.D Curelas's white-knuckled science-fantasy mash-up "Neither Snow, nor Rain, nor Heat-Ray." I forget how much I enjoy short stories. Often an anthology isn’t the first thing I pick up at the bookstore, but the experience of reading a well-curated collection is always satisfying. In the latest installment of her Magical Menageries series, editor Rhonda Parrish offered up the title Equus and invited writers to weave tales about mythical horses. The stories she’s assembled are varied in scope and tone, and they range in genre from pure fantasy to horror to science fiction, but they’re all I forget how much I enjoy short stories. Often an anthology isn’t the first thing I pick up at the bookstore, but the experience of reading a well-curated collection is always satisfying. In the latest installment of her Magical Menageries series, editor Rhonda Parrish offered up the title Equus and invited writers to weave tales about mythical horses. The stories she’s assembled are varied in scope and tone, and they range in genre from pure fantasy to horror to science fiction, but they’re all infused with a healthy dose of magic and mystery. What a great anthology! This book reminded me of how important short stories are. Not all stories need to be 400 pages long and these writers have proven it. Now I want to read Rhonda's other anthologies. I would also like to say, while I am here, that most male readers, and I am certainly guilty of this myself, tend to read stories written by male authors or from a male point of view. This anthology is loaded full of intense and imaginative female heroines. From battling demons to riding war un What a great anthology! This book reminded me of how important short stories are. Not all stories need to be 400 pages long and these writers have proven it. Now I want to read Rhonda's other anthologies. I would also like to say, while I am here, that most male readers, and I am certainly guilty of this myself, tend to read stories written by male authors or from a male point of view. This anthology is loaded full of intense and imaginative female heroines. From battling demons to riding war unicorns to dodging death rays, these heroines are great to read about. What another fabulous anthology from Rhonda Parrish and is the fifth in her Magical Menageries series. Equus is full of lovely short stories about horses, both real and magical! I am not usually a fan of horse stories but I really did enjoy this collection. I have this obsession with Unicorns at the moment so I was excited they were featured amongst these stories! I have read some of the other anthologies that Rhonda has edited and what I always find is how well written the stories contained within it are. Short stories are not to everyone’s taste but all of the ones in this anthology were well written and enjoyable. Some of the authors in this anthology I have read stories from previously and some are new to me – I think I have definitely found some new authors to investigate! If you are a fan of horses and stories with a magical twist then I think you will enjoy any of the wonderful short stories in this anthology. They will take you on a journey to a different world and have you thinking about their meaning long after you have finished reading! A delightful collection of short stories involving horses (or horse-like animals) in some way. Most are excellent, but some are brilliant. Review to follow. I'm SO not a horse person, but the variety of ideas and broad spectrum of horse types worked well. Good collection. In this Anthology there are 19 different authors with one common theme.....Freedom. The authors are all writing about horses in the fantasy spectrum. These authors are sharing the love of horses. If you are a fantasy horse lover this anthology would be great for you. There are so many different types of horses in the fantasy world. The great Pegasus that comes from the stars. The Martian horses, the crazy race horses, there are a couple different stories about races and bets on horses, a lady that knits her way into the stars to be with Pegasus, robotic horses. Just more and more. There is even a short advice book from a mother Unicorn to her daughter. There are some books that are wistful and then there are the suspenseful and almost horrifying stories. These books will keep you engaged and leave you wanting more. Horses are very powerful creatures but they can be very brave, loyal, and loving as well. You can get lost in the majesty of them in this anthology. Nineteen tales all about horses, real and fantasy. This is definatly a collaboration of books that will draw you in and help you escape from reality for a while. Nearly everyone loves horses. Very good anthology. This anthology can be ready by all audiences as it is of the fantasy genre more than romance or anything else that would require reader discretion. The different authors are J.G. Formato, Diana Hurlburt, Tamsin Showbrook, M.L.D Curelas, Laura VanArendonk Baugh, VF LeSann, Dan Koboldt, J.J. Roth, Susan MacGregor, Pnat Flewwelling, Angela Rega, Michael Leonberger, Sandra Wickham, Stephanie Cain, Cat McDonald, Andrew Bourelle, Chadwick Ginther, K.T. Ivanrest, and Jane Yolen. Equus by Rhonda Parrish is the 5th book in her anthology series Magical Menageries. It contains stories by by Jane Yolen, Tamsin Showbrook, M.L.D Curelas , Laura VanArendonk Baugh, Dan Koboldt, Pat Flewwelling, Stephanie A. Cain, Sandra Wickham, and J.G. Formato. It is a collection of 19 short stories all revolving around a horse in some shape or form. Whether it is a Pegasus or a steam-punk version you can bet a horse will be in these stories. In Stars , Wings, and Knitted things by J.G. Formato Equus by Rhonda Parrish is the 5th book in her anthology series Magical Menageries. It contains stories by by Jane Yolen, Tamsin Showbrook, M.L.D Curelas , Laura VanArendonk Baugh, Dan Koboldt, Pat Flewwelling, Stephanie A. Cain, Sandra Wickham, and J.G. Formato. It is a collection of 19 short stories all revolving around a horse in some shape or form. Whether it is a Pegasus or a steam-punk version you can bet a horse will be in these stories. In Stars , Wings, and Knitted things by J.G. Formato we meet Annie. She used to be happy, and in love with her husband, Marcus. Annie used to have a job that she loved at a nail salon while Marcus was in law school. After graduating and becoming a paralegal things began to change. The fun they used to have has been replaced by the ever important “Climb”. Annie notices Marcus pulling away but can’t seem to care. You see Annie has a secret, and its name is Pegasus. Pegasus shows Annie where she really belongs she can be herself. It is a story about being true to yourself and no one else. In Eel and Bloom by Diana Hurlburt we meet Bea. She is a talented horse racer. She is also headstrong and defiant. In this story we see just how far she is willing to go to win a race. Bea uses some clever tricks throughout the race to give herself an advantage over the other racers. It is a story about not backing down and giving it everything you’ve got. In A Complete Mare by Tamsin Showbrook we get to meet Verity Marshall. Verity just so happens to be a descendant of Loki. For those of you who don’t know on Norse mythology Loki was a shapeshifter. Using this power he gave birth to Odin’s horse Sleipnir. Turns out it’s not just her that is descended from a god. Pick a god and you can bet he has part human descendants running around now that the Shift has come and gone. This story was much more actions orientated than the earlier story were. It set a fast pace and really pulled you in. Neither Snow, nor Rain, nor Heat-Ray By M.L.D Curelas is set in 1900 during a Martian invasion. Emma is an accomplished horse-woman and even with the world fall apart around her still takes time to care for her equipment and the animals in her care. It is because of her skill that she is conscripted as a messenger for the military. The Martians knocked out all forms of communication so people like Emma are invaluable. Again this story had plenty of action throughout. Interesting characters and a solid plot made this an enjoyable short read. Rue the Day by Laura VanArendonk Baugh I the story of Galyne. Galyne is a soldier and the partner of a War Unicorn named Nova. She is injured in a battle and is given a bodyguard named Rue. Over the course of the story it is reviled that he isn’t there to guard her at all. He’s there to steal her ability to train the unicorns for war. At first it looks like his plan succeeds but ultimately it fails. This story reminds us all that we are what we do, not what is done to us. I give Equus (Book 5 in the Magical Menageries series) by Rhonda Parrish, 5 stars. She is not happy. Her husband wants her to be the perfect little wife. He used to find her quirky, now he is just anno I give Equus (Book 5 in the Magical Menageries series) by Rhonda Parrish, 5 stars. She is not happy. Her husband wants her to be the perfect little wife. He used to find her quirky, now he is just annoyed at how different she is. Her only solace is laying in the grass outside, staring at the stars, dreaming. When her husband buys her knitting needles to encourage her to get a hobby, she uses them in a way no one else thought possible. But maybe she will finally be happy. Bea is a Limerunner, she races a waterhorse-type of animal. Her mother admits to betting on her in this next race and she knows that there is more to the story than her mother lets on. Mother only cares about money and when Bea finds out just what is on the line, she has to fight harder in this race than she ever has. And possibly sacrifice more than she ever thought possible. Verity Marshall used to live a normal life. Then everything changed in one day. All of the descendants of the gods have been physically outed and it turns out she is one of them. Now she, as well as the other descendants are being hunted. She must stay hidden and protect her very pregnant sister. Will they be able to escape this current raid? The day the Martians came changed everything in Victorian London. They took out all ways of communication. They are bent on destruction of the human race. Emma used to be a lady in a family of well standing, but all has changed. She is a rider and has a good horse, so she has been recruited to help pass messages to others, helping her fellow people escape. But are her and her horse fast enough to keep out running the Martians? Is it all worth it? Galyne is a rider of a war unicorn. It takes a very special type of woman to ride the war unicorns and the other troop knows that they can’t get close enough to the unicorns to stealthily destroy them. Rumor has is that they are trying to destroy the riders now instead. Galyne thought she was safe, but turns out she was so very wrong. This is all she knows, all she loves. What will happen now? There are so many more great stories in this book, this is just a small taste. I have been fascinated with horses in the fantasy world and this book does a wonderful job of covering all types of horses in all types of stories. The stories were all written well and you will definitely not be disappointed in this anthology. I highly recommend this book to all of you horse and/or fantasy lovers. Or those who want something a little different than what you’re used to. Equus is an Anthology and also a part of Rhonda Parrish's Magical Menageries (volume 5) which includes work by various authors. These stories are all based off of one common theme: equines. Many of the stories vary from fantasy to a little suspense/horror. There are 19 stories in all. There are different versions of equine like the popular unicorn mentioned in each story. The first story in the anthology is Stars, Wings and Knitting Things written by J.G. Formato. This is Annie’s story about fee Equus is an Anthology and also a part of Rhonda Parrish's Magical Menageries (volume 5) which includes work by various authors. These stories are all based off of one common theme: equines. Many of the stories vary from fantasy to a little suspense/horror. There are 19 stories in all. There are different versions of equine like the popular unicorn mentioned in each story. The first story in the anthology is Stars, Wings and Knitting Things written by J.G. Formato. This is Annie’s story about feeling out of place, not belonging. She was always the outsider, the odd one growing up until she meets Marcus. Then a childhood friend returns, she thinks she’s dreaming or even seeing ghosts. Until she finds she white sparkling feather…. Equus by Rhonda Parrish is the fifth book in a series called “Magical Menageries”. I enjoyed the book and the stories were good. Some grabbed my attention a little more than others. I love to knit, and so when I read the synopsis for this book, I was very much intrigued that knitting was going to somehow be included in one of the stories. Turns out it is the first story of the book. I will admit though that it took me a little bit to get “into” the story. It was just a little confusing at times Equus by Rhonda Parrish is the fifth book in a series called “Magical Menageries”. I enjoyed the book and the stories were good. Some grabbed my attention a little more than others. I love to knit, and so when I read the synopsis for this book, I was very much intrigued that knitting was going to somehow be included in one of the stories. Turns out it is the first story of the book. I will admit though that it took me a little bit to get “into” the story. It was just a little confusing at times and left you kind of wondering what was really going on. However, not all the stories were like that and some were quicker to read then others, which I think is only natural when you are reading a book full of short stories. I do think that the author did a great job and that no matter who you are, you are most likely to find at least several of the stories interesting and a good read. Some of the stories are fantasy, and they take you into the depths of your mind. Then others stories may bring you back down to Earth with a story that is a little more realistic, such as racing a horse in order to save your freedom. It seems as though each story all comes back to “freedom” in some way. All the stories of course deal with horses or a form of horses if you did not already gather that. Some can fly, some ae unicorns and others are just plain old normal horses. This book was a little out of my norm and even comfort level. However, I do like horses and again like I said was intrigued to see that one of the stories included knitting. I think any horse lover is going to Love the book and even if you are not someone who loves everything horse, it is still a good read. The stories are relatively quick reads with each one going in its own direction. 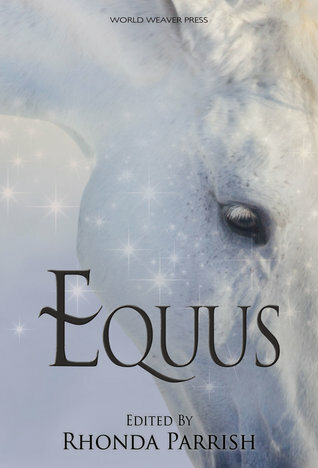 Equus by Rhonda Parrish is a book full of short stories about horses, unicorns and other horse like creatures. It is nothing like I have ever read before. I would rate it 3/5 stars as I feel many of the stories need some more development or background in order to catch the reader’s attention. The first story “Stars, Wings and Knitting Things” tells a story of a newlywed whose husband is never home due to work. She is characterized as crazy and is an “embarrassment” to husband. She ends up on thi Equus by Rhonda Parrish is a book full of short stories about horses, unicorns and other horse like creatures. It is nothing like I have ever read before. I would rate it 3/5 stars as I feel many of the stories need some more development or background in order to catch the reader’s attention. The first story “Stars, Wings and Knitting Things” tells a story of a newlywed whose husband is never home due to work. She is characterized as crazy and is an “embarrassment” to husband. She ends up on this fine Pegasus riding off into the sky. I wish there was more background, how did she meet the husband she grew to hate? Was there a mental health disorder? The second story “Eel and Bloom” tells the story of night racing with lime runners and water-bred. It tells the story of what would be considered illegal racing in today’s views and is interesting but it hints at a corpse flower but never really tells the story of it, though the whole short story is written around this flower. What is it? Why is it so important? How did the family come by it? I feel that most of these stories could easily be expanded into full novels and I hope that some of the authors will choose to do so. This was a good book and should be read by anyone who loves anything about horses, unicorns and such things. Equus: Magical Menageries Book by Rhonda Parrish is a wonderfully magical collection of stories revolving around horses by the following authors: J.G. Formato, Diana Hurlburt, Tamsin Showbrook, M.L.D Curelas, Laura VanArendonk Baugh, VF LeSann, Dan Koboldt, J.J. Roth, Susan MacGregor, Pnat Flewwelling, Angela Rega, Michael Leonberger, Sandra Wickham, Stephanie Cain, Cat McDonald, Andrew Bourelle, Chadwick Ginther, K.T. Ivanrest, and Jane Yolen. I gave this fantastical find 5 stars! Omg, did this Equus: Magical Menageries Book by Rhonda Parrish is a wonderfully magical collection of stories revolving around horses by the following authors: J.G. Formato, Diana Hurlburt, Tamsin Showbrook, M.L.D Curelas, Laura VanArendonk Baugh, VF LeSann, Dan Koboldt, J.J. Roth, Susan MacGregor, Pnat Flewwelling, Angela Rega, Michael Leonberger, Sandra Wickham, Stephanie Cain, Cat McDonald, Andrew Bourelle, Chadwick Ginther, K.T. Ivanrest, and Jane Yolen. I gave this fantastical find 5 stars! Omg, did this book take me back to my childhood where I was obsessed with all things horses and unicorns! This anthology is more fantasy than romance, so readers of all ages can enjoy! Such a quick read too, but a novel you will definitely want to return too from time to time. The common thread weaving each tale together (horses aside) would be freedom, and the journey of self-discovery finding your path-your inner strength. The stories vary greatly in equine “types” such as Pegasus, Unicorns, alien horses, robotic horses, etc! Some tales are darker than others, and some are just pure fun. I loved every single one! I love what these magical creatures represent: power, grace, strength, compassion, loyalty, and beauty. Each story building upon the previous one, each unique, each inspiring! Now I will be checking out the other Magical Menageries to add to my collection! Equus (Rhonda Parrish's Magical Menageries book 5) is a book of wonderfully magical told short stories about different horses including unicorns. If you love horses, real or imagined you will love reading these stories about love, freedom, and fantastical places these authors imaginations can take you. There were some stories that I related to more than others, but I thoroughly enjoyed reading them all. I have read some work from some of the authors featured in this book but there were some I ha Equus (Rhonda Parrish's Magical Menageries book 5) is a book of wonderfully magical told short stories about different horses including unicorns. If you love horses, real or imagined you will love reading these stories about love, freedom, and fantastical places these authors imaginations can take you. This book is not normally something I would read but I actually got into a few of the stories. With nineteen stories in all you are sure to find one that will pull you in. So many great authors included in this book Tasmin Showbrook, JG Formato, Jane Yolen, and Dan Koboldt, just to name a few. In “Different” the main character travels a long distance and spends a lot of money to ask a unicorn to heal her disabled daughter. It does not turn out the way she plans, and I can’t help but wonder why sh This book is not normally something I would read but I actually got into a few of the stories. With nineteen stories in all you are sure to find one that will pull you in. So many great authors included in this book Tasmin Showbrook, JG Formato, Jane Yolen, and Dan Koboldt, just to name a few. In “Different” the main character travels a long distance and spends a lot of money to ask a unicorn to heal her disabled daughter. It does not turn out the way she plans, and I can’t help but wonder why she went all that way and spent tons of money but never researched how it all worked. It seemed far-fetched even for a story about unicorns. In “A Complete Mare” Verity was used to a normal life until all of the descendants of the gods have been outed and it turns out she is one of them. She must hide to save not only her life but her pregnant sister’s life too. This is the story that really pulled me in. I really wish there would have been more to this story; I would have loved for the story to go on. Maybe even be made into a romance. The anthology Equus is all about horses. These stories have horses of all types and varieties. I have loved horses since I was little and these stories only deepen the love I feel for them. There are magical horses, unicorns, ghost horses, all ready to take you on a journey that you will not soon forget. From the very first story, I was hooked. I found myself quickly reading every single one and wanting to read more about these magnificent animals. These stories not only entertain, they also teach lessons and touched my heart. I have read one other of the Magical Menageries series and have found that I truly enjoyed that one and this one as well. When I read anthologies I love that I find new authors whose work I have never read before and that now I can follow their other stories. So sit back and be ready to lose yourself in a world of fantasy! Equus is the fifth volume of Rhonda Parrish’s Magical Menagerie series. It is an anthology made up of nineteen stories and poems by some truly talented authors. Each story/poem is unique. They’re all quite individual and distinct from each another; but they all have the same inspiration/theme- which is Equus (the horse). Who doesn’t love horses? In this compilation of stories we discover all things equine- from winged horses flying through he skies; or water horses racing through their watery world; or mechanical horses set on adventure; we meet a myriad of different horses that will capture our imagination and lead us on a fantastic journey. The works contained in this Anthology al span the fantasy spectrum- each one has its own voice, tone and mood. There is bound to be something here to fall in love with. So prepare for a wonderfully riveting ride, as we gallop through the pages to discover the wonders within. Equus is a part of the Magical Menageries series edited by Rhonda Parrish. I have read a few of her anthologies and I love them! The Magical Menageries series is full of adventure and fantasy! This one is all about the Wild and the Free! Horses take us to magical places and set us free! These short stories hand picked by Parrish are the pure essence of mind body and soul of freedom! A few of my favorite stories included constellations and knitting, demon herding storm horses, and advice from a unicorn mother. Each story is completely unexpected and unique taking us into many different worlds. I love reading so many different point of views all set on one topic! That is the best thing about these anthropologies! I can't wait to read more from this magical series! Equus Is an anthology of nineteen stories featuring horses and freedom. Some of these stories are true to life while others are full of fantasies and magic. I love this anthology because you get so many perspectives. Most of the authors I have read before, but there were a few that were new to me. I enjoyed the different emotions I felt with each story, some made me sad, or angry, or happy. I usually don't enjoy every story in an anthology but this was different, I loved each one. I didn't have a favorite, but I love horses so what's not to love. I didn't read all of these short stories, but the ones I did read were good. I love horses but am not so fond of reading short stories. I thought the love of one would cancel the other. Sadly not. My fault, nothing to do with the book. I may get around to dipping into it in the future, but I needed to take it off my Goodreads 'currently reading' status and there didn't seem to be a way to do that invisibly. The one star rating on this book isn't really fare. I've given it a star rating of 1 because I didn't like the book, not because I didn't think it wasn't a well complied anthology or well written stories. It just wasn't a book for me. This fifth and final collection in the series stands up to the quality established by the first four. As I'd mentioned about the earlier books, I was never a big fan of fantasy writing, but these stories transcend far beyond the boundaries of the genre. It's a collection I will keep on my shelf and revisit again and again. Full disclosure: I have a story in this, so I'm somewhat biased. However, as a fan of horses and books with horses and horse stories, I can say that other horse fans will adore this book. Unicorns, pegasi, kelpies, Sleipnir the Norse horse, and just plain ol' horses abound in this book.